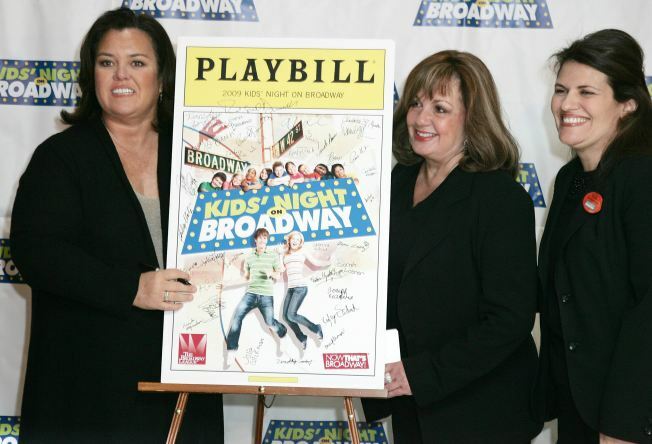 Rosie O'Donnell, Broadway League Executive Director Charlotte St. Martin and General Manager for Madame Tussauds Janine DiGioacchino at the 13th Annual Kids' Night On Broadway. It's one element luring more children and teens to the theater. So many stereotypes about Broadway are confirmed -- and disputed -- in the most recent survey of who exactly is filling all those theater seats. Despite what Will Ferrell's W character may say, it turns out it's not just gay men in the theater district. But it is mostly the tourists. And women in their 40s. Make that white women. And they're not really struggling financially, either. The new report, The Demographics of the Broadway Audience 2007-2008, released today by the Broadway League shows that tourists bought 65 percent of all Broadway tickets. The audience was 66 percent female. While the average age was about the same as in the past -- 41.5 years old -- a record 12.4 percent of the audience was made up of children and teenagers. Not coincidentally, the Kids Night on Broadway program has now gone monthly and the season included many musicals aimed at families, including "13" with an all-teen cast .